On a hot July day such as this a smoothie is exactly the thing to hit the spot. 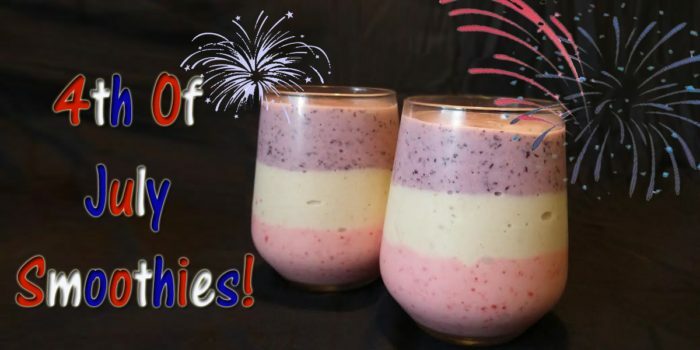 Make it a patriotic smoothie complete in red white and blue and what could be better! Can you believe I’ve never made a smoothie? I have had them sure, but it was one of those things I would treat myself too occasionally on a hot summer day while I was out running errands. If I am being even more honest, it was normally just a quick one from McDonald’s… which now will never compare to these yummy treats I discovered. 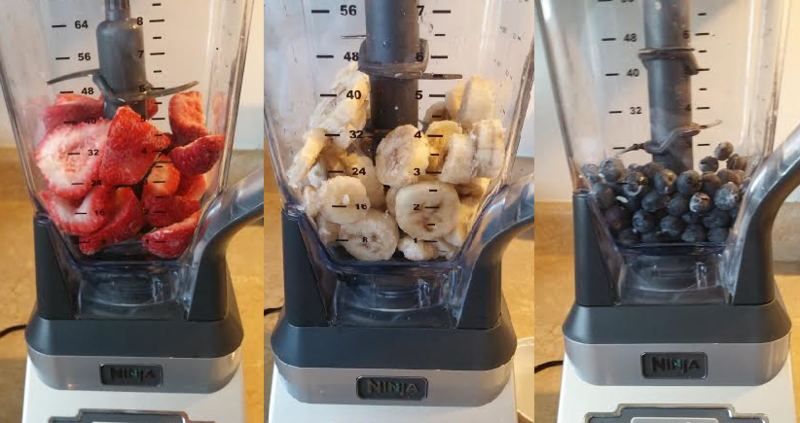 Who knew making a smoothie was so easy! Now that I figured out how to make them Ill admit I may have gone a little smoothie crazy, but you have to understand a little. 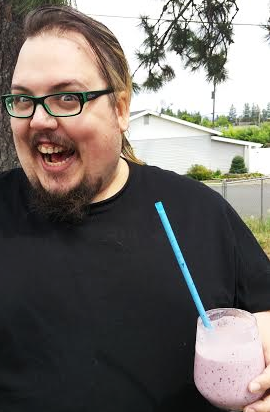 I mean its the 4th, of course I needed to make three different kinds of smoothies so that I had one in each color. Only makes sense, right! If you are freezing fresh fruit make sure to rinse, pat dry and cut them before freezing them. I was not thinking properly when I put my strawberries in the freezer. Sure I rinsed them and had them dry… but didn’t think to cut them up first. Trust me, cutting a frozen strawberry is not fun. Skip that experience and just cut them first! Thankfully I was thinking enough to dice my bananas before putting them in the freezer, my brain started working again by the time I got to that. Depending how big/many smoothies you want will effect your measurements a little. I was making a bunch of smoothies so I used the measurements listed. If only planning on making a few glasses worth, cut my measurements in half. 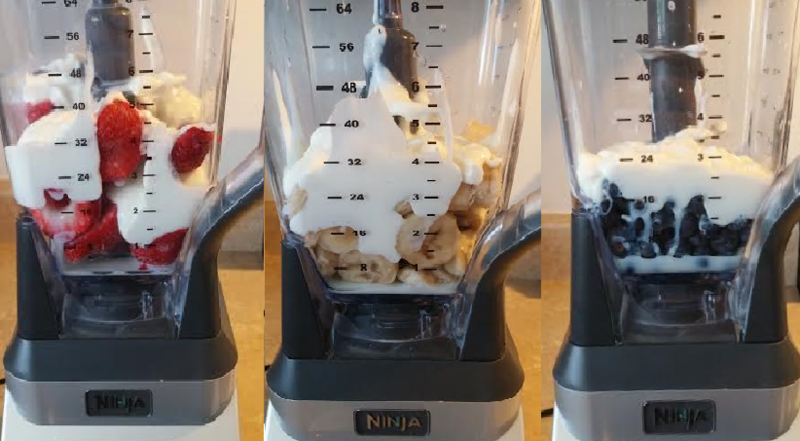 Once you have all the ingredients it is so super easy to make, just a little time consuming considering you are technically making three different smoothies and then layering them. Start by putting your frozen fruit in the blender. I did it in order I wanted it to sit in the cups, so I can just layer them as I go. So I started by making my strawberry smoothie, then banana and finally blueberry. 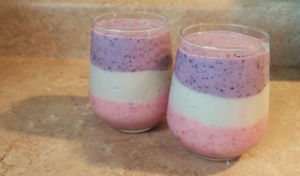 Now add in 1 cup vanilla yogurt and 1/4 cup milk to each smoothie. 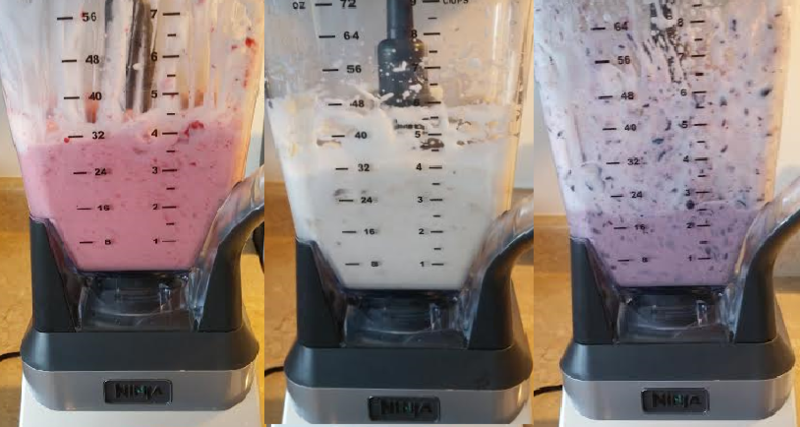 Blend until smooth and creamy, avoid overmixing otherwise it will become more runny (unless that’s how you like it). Have an amazing and safe 4th of July everyone!! !